If you still think comics are just Batman and Manga check this out. I’m so amazed how easy it is to go months without seeing a single mention of a significant graphic novel. There’s a huge assortment of very moving and intriguing stories. 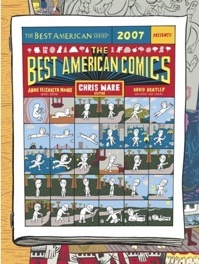 [list here] I think we all have have Art Spiegelman to thank for Maus I and II. It jumpstarted the non-fiction aspect of graphic novels and the work of the primo practicioner of first-hand comic storytelling Joe Sacco is indebted to Spiegelman. Check out some interviews with Sacco, the ‘innovator of modern comic journalism’ at the Village Voice and at LA weekly. 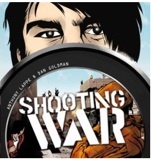 I finished “Shooting War” by Anthony Lappe over Winter vacation. It was a little too flashy for my taste. The story tries to address what goes wrong when live video blogging/war/media politics converge. (we can already live videoblog) The use of real photos from Iraq as backgrounds is pretty well done though, and the portrayal of Dan Rathers circa 2020 is hilarious. It’s a quick read, but sensationalizes everything. You know, in that anti-corporate McDonalds arches on U.S. tanks sort of way. In related news, Persepolis, a comic by Marjane Satrapi about growing up during the Iranian revolution, was made into a movie, but I heard it’s not that fantastic. I have yet to see it. It’s no Frank Miller, but it provides a very honest perspective of the Iranian revolution of 1979, and what it meant for those actually in Iran.